(333/11) 364 Eddy Street; Hotel Eaton (1911), Hotel Rand, Hotel Elm (1929). Rooming house with eighty-seven rooms and forty-eight baths. 5B stories; brick structure with glazed brick veneer; four-story galvanized iron bay windows and cornice; two-part vertical composition; Renaissance/Baroque ornamentation; vestibule: marble walls, paneled ceiling, tile and marble floor; lobby: desk space with Ionic columns and beams. Alterations: marquee at entry, security gate. Original owners: R. J. Sullivan and George Gale. Architect: L.M. Gardener. 1911. The Tenderloin’s architectural character—its personality, if you will—is defined as much by its blade signs as it is by the buildings themselves. The Elm’s neon blade sign had been restored just a few days before I took this photograph, so it was absolutely pristine. The bluish tint of the tubes spelling out “hotel” indicates that the tubes are brand-new. As white tubes age they become yellowed, so that blue tells a little story of its own. (337/1) 401-411 Eddy Street; Holckele Hotel (1907), Allen Hotel. Rooming house with twenty-nine rooms and eight baths, and stores. 3B stories; brick structure; brickwork quoins and flat arches, galvanized iron cornice; two-part vertical composition; Renaissance/Baroque ornamentation; vestibule: pedimented entry, tile floor; lobby: cornice molding; signs: neon blade sign “Allen Hotel”. Alterations: security gate, storefronts. Original owner: L. Holckele. Architect: Julius E. Krafft. 1906. Born in Germany and educated at Stuttgart, Julius E. Krafft immigrated to America in 1872, spent a couple of years in Chicago, and moved to San Francisco in 1874. For twelve years he ran the drafting department for T.J. Welsh (Welsh and Carey)* after which he opened his own business. 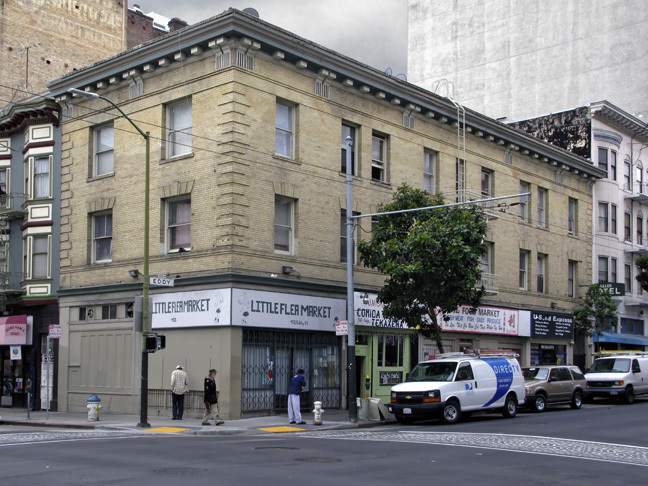 Among the buildings designed by Krafft are the St. George Apartments, Hotel Verona, and the Allen Hotel in the Tenderloin, St. Paulus Lutheran Church at 999 Eddy, a Lutheran church in Alameda, and numerous private residences. G. Albert Lansburgh, architect of the Warfield and Golden Gate Theaters, worked for Krafft while studying at UC Berkeley. 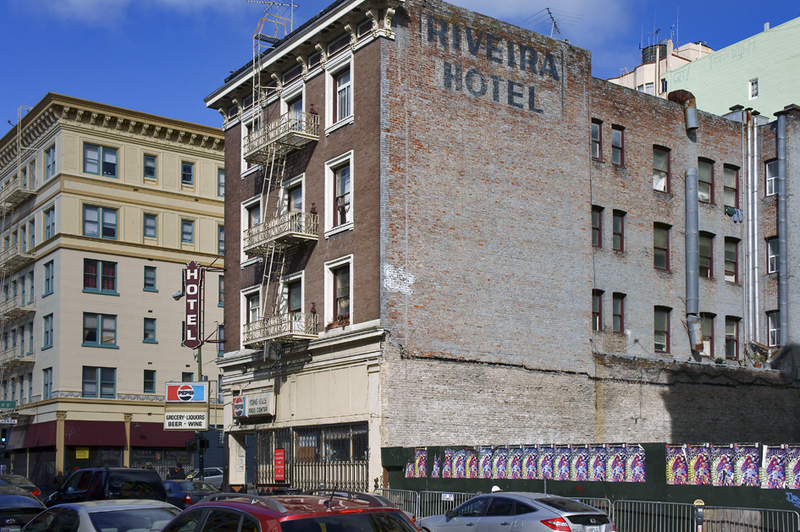 *Buildings in the Tenderloin designed by Welsh and Carey include the Rocklin (Western) Hotel, Hotel Proctor (Pacific Bay Inn), and an apartment building at 965 Geary. Note how the pediment above the entrance is reflected in the shape of the blade sign. Blade signs were once a dominant feature of central city streetscapes. Of those that remain in the Tenderloin, some still have neon fixtures and many of these in recent years have been restored. Eddy above Leavenworth, 1947. In the mid-40s, the Tenderloin’s biggest problem was double-parked cars. The tracks are for the 31 streetcar line, which was discontinued two years after this photo was taken and is now the 31 Balboa trolley line. (345/1) 151-169 Leavenworth Street; Page Hotel. Stores and rooming house with sixteen rooms and four baths per floor. 4B stories; brick structure; brick quoins, galvanized iron belt course and cornice; two-part vertical composition; Renaissance/Baroque ornamentation; vestibule: arched and pedimented entry, paneled walls; neon blade sign at entry: “Page Hotel”. Alterations: security gates and grilles, remodeled storefronts, partly remodeled vestibule. Original owner: A. G. Page. Architect: Martens and Coffey. 1907. The ornamental details of some buildings are so simple and understated that the aesthetic of the buildings’ entries, often further obscured by security gates and bad paint jobs, is lost in the visual chaos that all too often exists at street level. Under the grime and the mismatched colors, the entrance to the Page is actually very handsome.